The format for Scot Nery’s weekly BoobieTrap show is the wackiest I’ve ever seen. It’s vaudeville on steroids with Nery as the amped up and kooky ringmaster. The performers range from jugglers to contortionists, magicians and poets – but the first time I attended, the standout talent was a wooden dummy named Joey and his human named Karl Herlinger. I’ve seen ventriloquist acts before, but these two had an edge that kept me thinking for days on end, and at times I forgot about who was controlling whom. 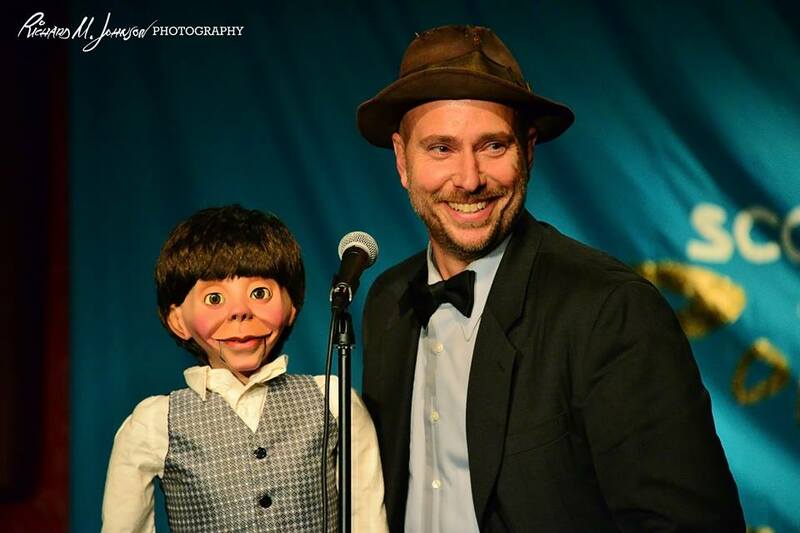 If you stop and think about it, the very idea of ventriloquism is pretty darned crazy. These performers choose to get in front of theaters full of people and have heated conversations and arguments with themselves. It’s hard enough to captivate an audience with story, dance, or musical talent when all you have to worry about is yourself, but imagine having to simultaneously play the role of two distinctly different personalities, while controlling a hidden levers that create the illusion of emotions in a wooden dummy. The strange combination of skills that must come together to pull something like this off has to be the reason we don’t see more great ventriloquists. This is a difficult and dying art. I’ve hung out with Karl a few times since I first saw his show and I appreciate that his abilities go far beyond controlling inanimate objects and throwing voices. There’s definitely meat on the bones here and though his lip control and manipulations are very, very good, it’s the storytelling that makes you want more. After 35 years of honing his craft, Karl pushes himself with the question of how small he can make the show and still have it resonate. He knows that if the base story is strong, people will forgive a lack of props and complex manipulations. Karl says that anyone can learn to throw voices and “work a puppet’s guts” but not everyone can give a story heart. I’ve seen plenty of performers do amazing things with their craft but simply appear mechanical – like a juggler who can keep may balls in the air but tells no visual story while doing it. Scot Nery is a great example of a fant juggler who can keep many balls aloft but what he’s really know for is juggling one item at a time – a real pancake. He takes the audience on a hysterical journey as he cooks the pancake in front of you and then flips it around the stage in unimaginable ways. Again, it’s only one object, but the show is much better than a juggler who can keep 10 balls in the air for any length of time. He answers himself by swapping out the Joey puppet all together, fixing googly eyeballs to his fist and calling him Larry. The new show slays audiences and his new character is more real than anything he’s done before. This is a clothed version of Larry with bunny slippers and a set of googly eyes on his own hand. Larry seems human, and real because Karl is a master of his art and the dialogue is touching, you will want to hug him. We all think we understand what Karl does on stage because of conversations we’ve had with casted shadows on bedroom walls. But, you really have to see Karl, Joey and Larry in person to really know what’s going on. For anyone who wants to build their own ventriloquist doll, I leave you with this up-to-date and easy to understand schematic. What could be simpler to build and learn to operate? !